Several years ago, my mom discovered Yehuda Gluten Free Toasted Onion matza – and keeping Passover suddenly became SO much easier, I mean, this matza is delicious. Little did we know, my mom was an early adopter in the Gluten Free Passover world, and that we’d need to rely on it keeping Passover at our house. This year, I’m also currently not eating anything with eggs – which presents a bit of a problem-o when it comes to eating GF matza – everything has egg! So in my typical fashion, I came across a simple Gluten Free + Vegan Matza recipe, and made it. While the instructions are easy, the process is time-intensive. Two pieces of matza in, I decided I will just be making this for myself, since everyone else at our seder tables can eat eggs. It is quite good, but needs to be crispy to truly taste like matza, and that takes about 10 minutes per matza. I added dehydrated onion flakes + garlic granules, to give it more flavor – which I definitely suggest. The infamous Everything But the Bagel Seasoning would be great too, if you can have sesame. Lastly, Cassava Flour isn’t cheap, but it’s a good kitchen staple, if you’re cooking gluten free. I haven’t found it to be a 1:1 flour swap, but the recipes intended for it, turn out great and on the more satisfying end than other foods made with other GF flours. The tortilla recipe on the back of the bag is easy and tastes great – just use more olive oil than it calls for to make it less crumbly – same for the matza. Chag Sameach! Preheat oven to 475. Combine all ingredients (including dehydrated onions and garlic) in a medium-sized mixing bowl. Stir the ingredients to combine, then mix by hand to form a ball of dough. I find I need to add little bits more oil when I’m kneading it, to get it to a wet, but not sticky, dough. I do little bits of oil at a time, and then will add a little more to my hands for the next step. Divide dough into 6 equal pieces. Roll out each piece of dough on a lightly floured piece of parchment paper (using potato starch to dust). NOTE: When I take the parts of dough out I make sure my hand has a little avo oil on it, and knead it a bit more. I also use a second piece of parchment paper on top of the dough ball – I find that helps roll it out better. You want the rolled out dough to be thin, so it can become crispy. If it breaks, just take a little bit from the edges and push it in, so that you have approximately a 6×8 inch rectangle. Once a rectangle, poke holes vertically in the mazta, and transfer matza on parchment to a baking sheet, and bake for 3 minutes. Remove baking sheet and turn matza over carefully and bake for 3 minutes on opposite side. You will want to watch the matza very carefully so that it does not burn or brown too much – I liked some brown marks on it, and found I needed to put it back in flipped over once more, for another 3-5 minutes. Repeat for all of the dough. NOTE: Kosher laws require that matza be made out of 1 of 5 grains in order to be acceptable for Passover. Technically, this version is not K for P, but it is still a great alternative if you can’t have grains or eggs! TIP – If your matza is on the thicker side, it will take longer to cook. If it’s brown but not yet crisp, turn down the heat to 350 to finish baking. Tate’s Chocolate Chip cookies are quite possibly the best cookies ever. It’s been almost 5 years since I’ve had one, but I can still remember how buttery and crisp they tasted. Many allergy friendly desserts leave much to be desired, and I’m constantly trying new recipes whenever I have a sweets craving. This one from the Tate’s Bake Shop Cookbook is the best recipe I’ve made yet. Even with my adaptations it’s excellent. I think because I used golden brown sugar instead of dark brown, they came out like more traditional cookies; but evenso they are SO good. They taste buttery, albeit not crispy like original Tate’s cookies, and hit the spot! The texture is good and it got the B seal of approval, who wanted to eat just cookies for dinner after I made them. Feel free to swap out your traditional flour, eggs, and butter – I know they’ll still taste wonderful. In another large bowl, cream the butter and sugars. Add the water and vanilla. Mix the ingredients until they are just combined. Add the “eggs” and mix them lightly. Stir in the flour mixture. Fold in the chocolate chips, don’t overmix the dough. Drop the cookies 2 inches apart onto the prepared cookie sheets using two tablespoons or an ice cream scoop. Use 1 tablespoon if you want to make smaller cookies. [I got about 9 cookies on each baking sheet, leaving plenty of room for them to spread]. Bake them for 12-18 minutes until the edges and centers are browned. 15-18 minutes was the best timing for me, erring on the latter time helped them spread more to the size of traditional Tate’s cookies. They won’t be thin and crisp like Tate’s cookies, but more fluffy like a Chip’s Ahoy or traditional chocolate chip cookie. Remove the cookies and cool on a wire rack. The other part of our Christmas Eve Chinese Food meal was some really great sweet & sour chicken. I’ve made other iterations of this dish before, and this recipe is by far the best. 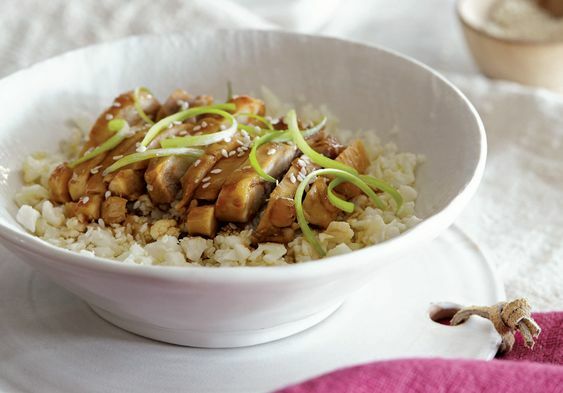 True to great Chinese food, it tastes even better the next day. I made it in a Dutch Oven, rather than a slow cooker, and used 1/2 white and 1/2 dark meat, rather than all dark meat like the recipe called for. I completely forgot to add the tomato paste (added at the very end) and it still tasted great. This sauce has just the right thickness and a balanced flavor. B wasn’t interested in trying it yet – he preferred his “teriyaki” chicken instead (will post that later) – but Scott and I loved it. Trim any visible fat from chicken and place in a singer layer in the bottom of the slow cooker, or dutch oven. Place the remaining ingredients (except broth) in a small bowl and mix together to make the sauce. Pour over the chicken to coat, making sure to get both sides. Add chicken broth if using a dutch oven – omit this step if using a slow cooker. DUTCH OVEN – Preheat oven to 350. Cook chicken, covered, for 30 minutes, or until chicken comes out at 165 degrees. SLOW COOKER – Cook on low for 4 hours. Remove the chicken and cut into cubes. Set aside. Spoon any extra fat from the sauce. Put remaining sauce into to a saucepan and simmer on medium-low heat until sauce has reduced by 1/2. I tested the thickness of the sauce by occasionally dipping a piece of chicken in the sauce, to see how it coated the chicken. I turned off the heat, once it reached the thickness I preferred. Return chicken to sauce, and keep heated until ready to serve. This hummus is amazing, and, this recipe may end up being an all-time favorite. (What else would I expect from Ina Garten?!) It does take a bit more time to make than traditional hummus recipes, but trust me, you will be happy you took the extra time to prepare this. There’s something so interesting (and addicting) about the butternut squash roasted with cinnamon, and then blended together with tahini and yes, even sriracha. Sweet, savory, and an ever so slight kick. The hardest part is figuring out what to eat it with, because this recipe makes A LOT of hummus! 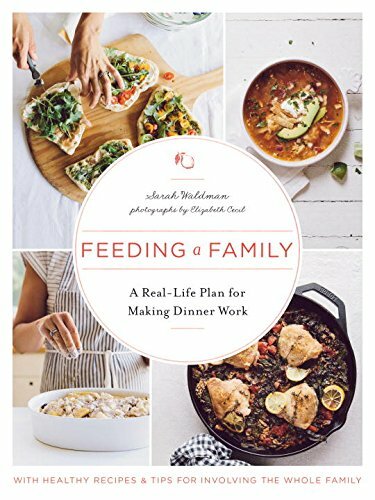 If you’re looking for something to bring for Thanksgiving, try this – we think it’s sure to be a hit (and even Vegan friendly). Toss the butternut squash with olive oil, salt, pepper and cinnamon. Toss with hands, and arrange in a single layer on a half sheet baking pan. Cook for 25 minutes, until tender. Let cool for 15 minutes. In a food processor, fitted with a blade, add all ingredients except the liquid reserved from the garbanzo beans and the maple syrup. Once butternut squash is cooled, set aside 1/4 cup of the squash and add the rest to the food processor and pulse everything to combine. If you want it smoother (I like it this way), add the liquid reserved from the garbanzo beans in small increments until you reach your desired consistency. Be careful not to puree completely – it should have some texture. Finish by putting hummus in a medium sized serving bowl. Top with reserved butternut squash and drizzle a little maple syrup if desired. It should last up to 3 days in the fridge. *You could also use traditional dairy plain yogurt. The recipe calls for plain whole-milk Greek yogurt. I don’t eat dairy, so I subbed for an equitable vegan option. If using a vegan option, I like nut-based plain yogurts, and make sure they don’t include “carrageenan” in the ingredients – not only is it questionable in my research if it causes digestion problems, but I’ve also found with it, the texture of the yogurt can be off too. My favorite non-dairy plain yogurts to use in recipes are Kite Hill (almond yogurt) and Forager (cashew yogurt). I also don’t eat soy, so I’m not sure how soy yogurt would taste, though I’m sure as long as it’s plain, it could be easily substituted. Cooking is the easiest way for me to zone out. I think that’s why I like making new recipes so much – I can focus on something and completely forget everything else going on around me. And, when there’s a day that I can go spinning and cook new recipes- well, that’s the ultimate. 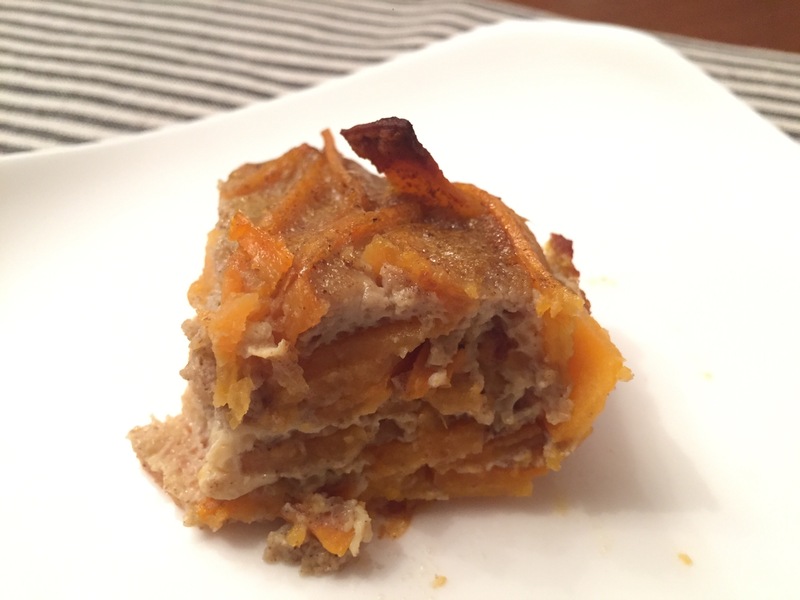 I read about this Sweet Potato Kugel recipe on a holiday round up from the cooks that authored The Yiddish Kitchen. I made bagels from their cookbook a few months ago, and I completely forgot about this kugel. I didn’t grow up on kugel like most. Actually, I was so particular, I would only eat it at my friend’s mom house, because then I knew it would be good! Anyway, this recipe is super easy and simple. 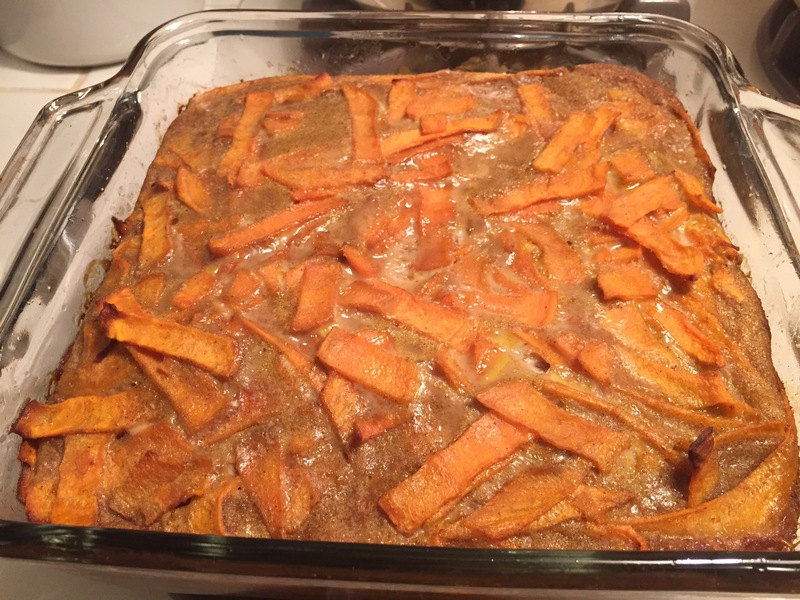 I even found precut sweet potatoes at Trader Joes to make the recipe even easier to make. You could certainly use regular sugar (the color will likely be different if you do) and you could use full-fat coconut milk, which probably makes it taste even more like the holidays. Enjoy! Preheat the oven to 375. Grease an 8×8 inch casserole dish. Then, in a skillet, heat the sweet potatoes in the olive oil over medium heat for about 6-8 minutes, or until sweet potato softens. While the sweet potato is cooking, mix all the remaining ingredients in a mixing bowl, stirring well to combine. Once the sweet potatoes are ready, remove them from the heat and incorporate into the egg mixture. Next, pour the mix into the prepared casserole dish and bake for about 30-50* minutes, or until an inserted toothpick comes out clean. Slice and serve warm. *the recipe says 30-40 minutes, but maybe because I used lite coconut milk instead of full fat, it took more like 50 minutes. After 35 minutes, I kept adding 5 more until it was set – the center took the longest time to do so. As I’ve mentioned before, my Grandpa loved to cook, as did both of my Grandmothers. 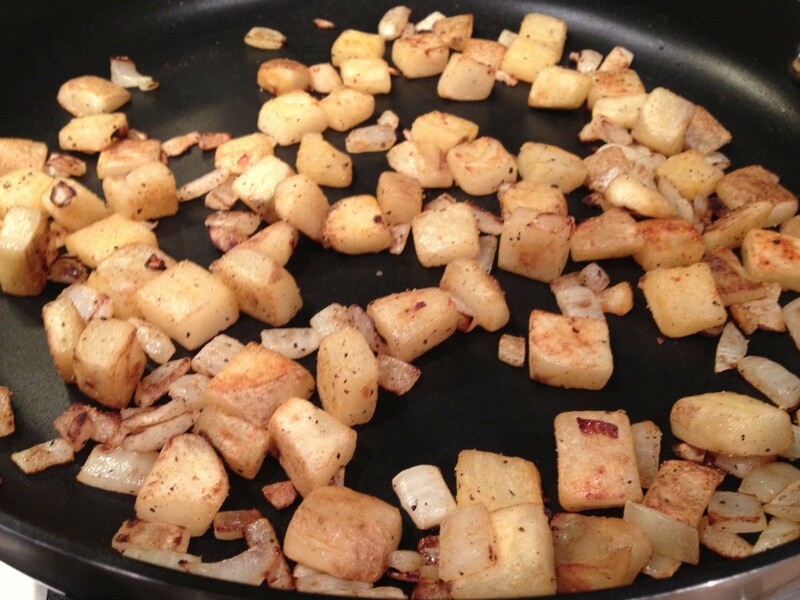 Of all their specialties, Grandpa’s breakfast potatoes are one of my all-time favorites. Growing up, breakfast was always an occasion. Aside from the great food, and something cracking someone up into a fit of laughter, it was where we discussed what was for dinner. What’s more important than that?! Not to mention, the potatoes themselves were special because they were pretty much the only time I remember eating them, other than on a holiday. With Passover during the past week, we had Shabbat Sha-Breakfast last Friday night, and I decided it would be fun to make Grandpa’s potatoes. My only challenge was figuring out a spice combination similar to his secret seasonings mixture (which made everything taste better). My Grandpa set a high standard for this recipe, but I think I came pretty close. Next, I’ll try to make my Grandma’s coffee cake, that she always wanted “just a sliver” of. Yum! 1. Heat a large nonstick pan over low-medium heat and add olive oil. Add onions. After a few minutes add a small pinch of salt and some pepper. Saute until starting to brown. 2. Add potatoes and cook until start to soften. Add a few shakes of garlic powder and paprika. Add more pepper, if desired. 3. Cook until potatoes are desired consistency. It’s that time of year when I start to gather recipes that I can use during Passover. While I’ve made the Barefoot Contessa’s Tomato Basil Soup in years past, I just found a new recipe from Phoebe Lapine, that’s likely to replace it. 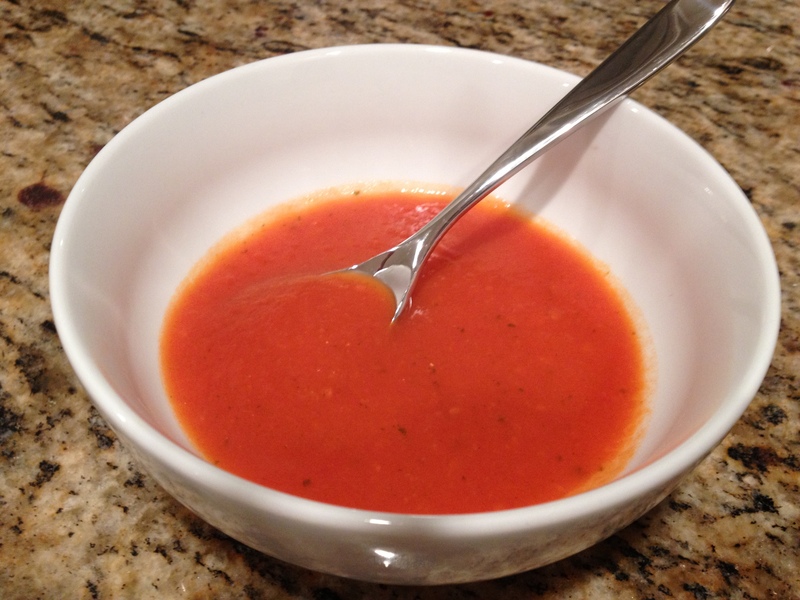 As the title suggests, it is a slow cooking recipe (about 5 hours), followed up with a quick blend of the mixture, leaving you with a delicious tomato soup with a kick. It’s a great to make during the weekend, with enough leftovers for the start of your week. Best part for me, no dairy and minimal clean up! Will this make your Passover list? I used 1/2 tbsp. Kosher salt, instead of 1 tbsp. Instead of a blender, I used an immersion blender, for a few seconds.